First, let’s talk about kinematic viscosity. It’s a measure of a fluid’s internal resistance to flow and shear under the force of gravity. It’s the most common unit of measure for viscosity and is expressed in cenistokes (cSt). Usually, these are tested at °40 and °100 Celsius and are almost always shown on product data sheets. On the other side, you have Saybolt Viscosities. These measurements refer to the results of a specific test producing measures of kinematic viscosity. The measurement is specified by ASTM D2161, but is largely considered to be obsolete. Still, it is commonly cited in lubricant product information. The numbers in the middle will most likely look a bit more familiar. 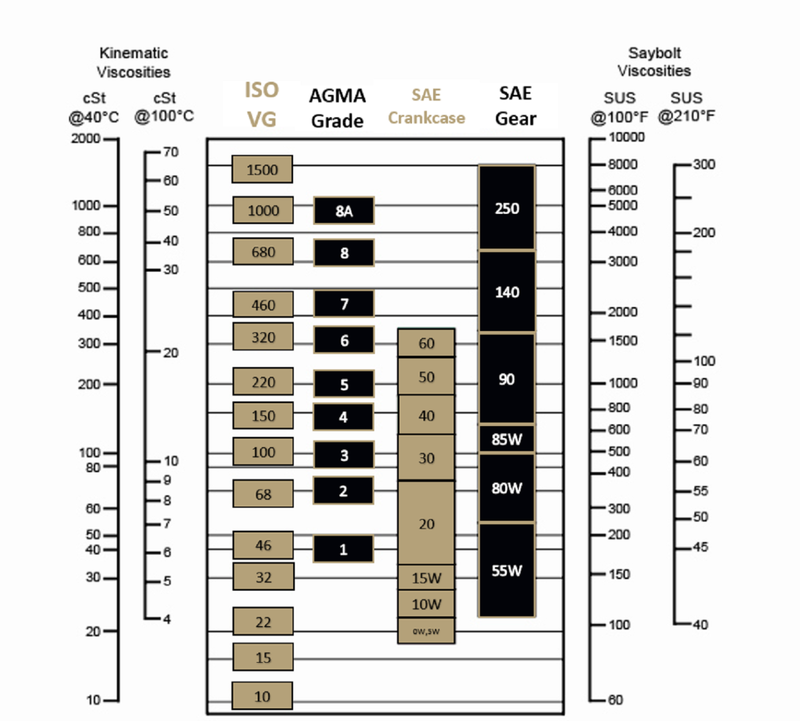 These are ISO Viscosity Grades, American Gear Manufacturers Association (AGMA) grades, SAE crankcase oil grades and SAE gear oil grades. Listed below them are the viscosity grades for these standards. So what’s the point of the chart? Basically, it allows users to determine whether or not lubricants will have similar viscosities. If you are used to working with one set of standards and suddenly get another thrown at you, this chart can provide a point of reference. Just read it horizontally. For example, an ISO 680 lubricant will have similar viscosity to an AGMA Grade 8 or SAE 140 gear oil.